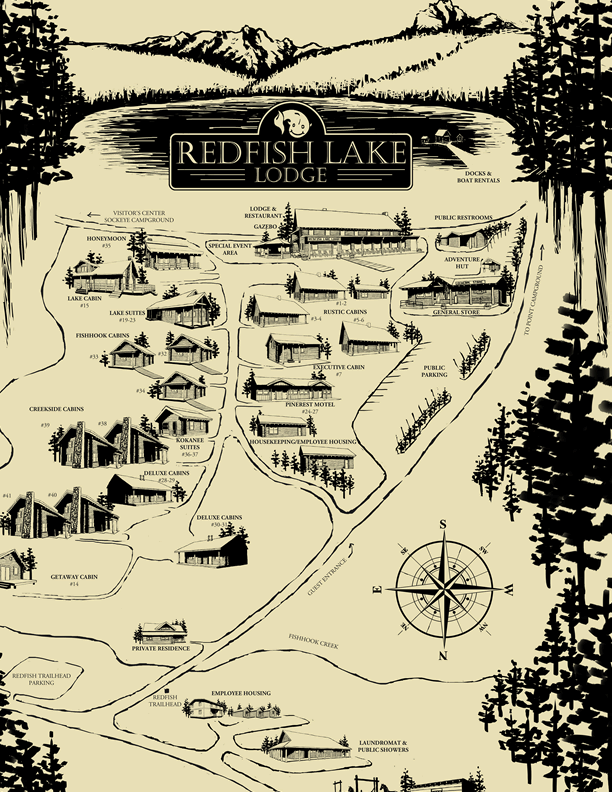 Redfish Lake Lodge is located 2 miles from U.S. Highway 75. Turn by the bridge at the junction of Redfish Lake Creek and the main Salmon River on Highway 75, near milepost #185. Go north on Highway 93 to the junction with Highway 75 in Shoshone. Continue north on Highway 75 through Ketchum, over Galena Summit, and through Sawtooth City and Obsidian. The turn for Redfish Lake is just before the bridge at the junction of Redfish Lake Creek and the Salmon River. Hint: The turn is near mile marker 185. If you reach Stanley, you’ve gone about 5 miles too far north. Go north on Highway 75 for 60 miles. You’ll pass over Galena Summit and through Sawtooth City and Obsidian. The turn for Redfish Lake is just before the bridge at the junction of Redfish Lake Creek and the Salmon River. Hint: The turn is near mile marker 185. If you reach Stanley, you’ve gone about 5 miles too far north. Go north on Highway 21 through Lowman to the junction with Highway 75 in Stanley. Turn south on Highway 75. The turn for Redfish Lake is just after the bridge at the junction of Redfish Lake Creek and the Salmon River. Hint: The turn is near mile marker 185. It’s about 5 miles south of Stanley. There is an airstrip in nearby Stanley (about 6 miles away). Redfish Lake Lodge offers free guest transportation to and from the airstrip. Call the front desk at 208-774-3536 to make arrangements for pick up.